It seems that each day the internet of things (IoT) becomes a bigger and bigger topic in the business world. But what’s often overlooked is that the IoT is also an internet of shared services and shared data. As a result, we’re becoming dangerously reliant on public internet connectivity to underpin many of the IoT’s new services. In my role as Chief Technology Officer, I repeatedly get questions about what the IoT and other newly emerging technologies will mean for the networks and infrastructure that support the mobile industry as well as business in general, and I recently compiled some of the most common of these, below, to help explain where we are with everything today. Mobile is now a bigger part of our lives than ever, and Syniverse has been right in the middle of mobile since the dawn of the industry. And mobile will also play a crucial role in the emerging IoT and networks it will require. We’re looking forward to being a part of this, and I invite you to check out the questions and answers below to understand how. I continually hear that the business world is undergoing a digital transformation the likes of which we’ve never seen before, and that in order for companies to survive in this transformed world that they will have to radically adapt their infrastructure and operations. But with the ever-increasing number of cyberattacks being directed at businesses today and the ever-widening surface of attack through which these attacks can be targeted, what are the critical challenges in making this transformation? Chris: It’s true that there is no shortage of change, and while there are some certainties at play, there are also many variables that will affect where different companies, applications and services finally land. One certainty is that every business that wants to survive and thrive will have to undergo a digital transformation, and that transformation will present known and unknown challenges that they will need to overcome. Companies that want to quickly add new services, bring on new partners, and open up new markets while managing costs are doing so digitally. They need systems to which their partners can securely connect; they need to embrace digital payments; and their customers want products that can be configured at the point of sale or updated over the air. Do we have the systems in place to handle that transformation? Do we know, at this stage, what those systems need to deliver for our business? And do we know whether they are cloud-based, edge-based or some combination? I hear a lot of debate over a cloud-based approach versus an edge-based approach versus a combined approach. What’s the difference between these and what’s at stake for businesses with each? Chris: Cloud storage and processing mean that companies don’t need to clog their own networks with vast amounts of data, and I don’t think that’s going to change anytime soon. However, for applications that need very low latency and rapid response times, edge computing or edge networking can move the data processing and experience closer to the user or application. Every business has different requirements, the first step in choosing the best approach is to really understand those requirements. For example, in an IoT environment requiring instant communications between a device and an application, certain computing processes can be undertaken at an edge-device level without reference to the cloud database to maximize speed. The combined approach comes into play when the results of those processes from potentially millions of devices in the IoT network are fed back to the cloud, allowing big-data analytics to identify process improvements to be relayed back to the edge device. That’s a network that is acting quickly but is also continually learning. What about “fog computing.” How is it different? Chris: While edge networking moves some of the processing power closer to the user or the application, fog computing moves other cloud capabilities closer to the edge as well. You could think of it as a network of mini-clouds, located closer to the application to reduce latency and speed response times, but also undertaking some of the storage functions and – in the IoT scenario explained above – serving many edge devices. While edge networking is device-based, each fog deployment serves many devices, and the host cloud has many fogs. To understand the security characteristics of cloud, edge, and fog computing a little better, could you explain how the network supporting these types of computing comes into play. What difference does the communications network that is used to underpin these types of computing make? Chris: All of these networks rely on two-way communications – sometimes local, but often national or global IP connections. Given the sensitivity and importance of the data that could be involved – whether business-critical operational data, safety-related information or financial data – companies will need these networks to be always available, always bandwidth-capable, and always secure. Without question, the public internet can’t meet these demands. Here’s a sample use case. In the utilities market, equipment sensors might be monitoring and controlling units within a plant but reporting back on their conditions to a private or hosted cloud. In this case, it will be absolutely vital that the links between the sensors and units are always and on and always secure, as these links are vital to feeding information back to the devices that determine the way they manage the equipment. More recently, there were reports of an incident involving the national power infrastructure in Ukraine, where the attackers got inside the network to manipulate the controls and cause widespread power cuts and failures. There was a similar case in the U.S. two years ago as well. For networks like that, the attack surface available to hackers is simply too wide to defend to be allowed to rely on public internet connections. So, what’s the solution to this public internet risk? Do business networks need to be private and closed? Chris: Partly. The networks do need to be private, but in many cases they will also need to be open. Let me explain by looking at the fintech market. The Second Payment Services Directive (PSD2) regulations coming into play in Europe will require financial institutions to open up their networks to third-party vendors. Lots of small, innovative companies will be looking to access these networks to sell new consumer services or provide innovation to a banking partner. Obviously, these networks that process data in the cloud for millions of financial transactions every moment need to be secure and protect consumer privacy. And opening them to partner companies will need to be tightly controlled. The host companies will need certainty to know, at all times, exactly who is connecting and what they are allowed to see and do. Again, that privacy cannot be guaranteed if those connections are coming in over the public internet, with its vulnerability to attack over such a wide surface. 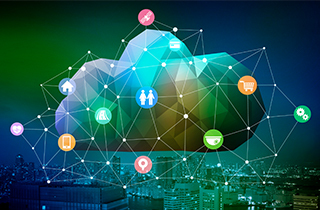 Business-critical networks – whether cloud, edge or fog – will need to be connected using communication links where the access is restricted, so the identity and rights of the people, applications and devices accessing them is strictly controlled. These networks must be protected from outside interference, with guaranteed availability and sufficient speed and capacity to deliver against well-defined service-level agreements. Those are the networks we expect to see rise and dominate in the future.